Synthetic lawn and artificial turf are perfect for private residences, businesses, sports grounds and anywhere that may need sprucing up or where there’s trouble keeping outdoor areas looking and feeling great all year round. With Surface-it’s high-quality synthetic turf, your business, home, or sports area can get the makeover needed to look beautiful, fresh, and stylish. 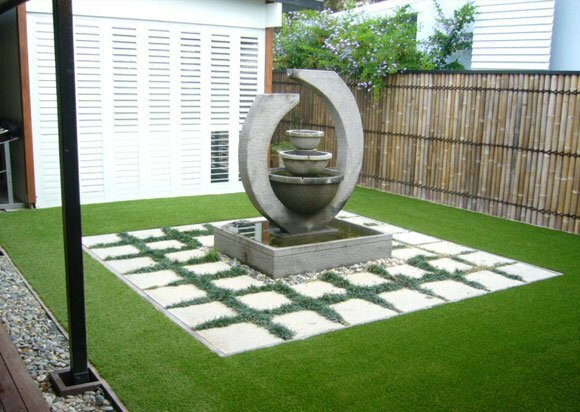 We’ve been providing artificial grass Brisbane wide and up and down the east coast for years, so we’re your best partners for getting the artificial lawn you’ve always wanted. 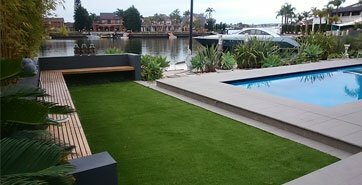 Surface-it artificial grass is proudly manufactured exclusively for the Australian market and is available throughout Brisbane and Sydney. Please call (07) 3041 4121 in Brisbane or (02) 8324 1314 in Sydney for more information. We’ll gladly provide the best synthetic grass solutions for your needs. Gone are the days of bright green Astroturf and similar surfaces. Today, some amazing low maintenance, realistically coloured synthetic lawns are readily available to please even the most discerning tastes. Artificial turf can also be a highly effective and flexible solution for many awkward landscape situations, sparing you the effort of maintaining a beautiful lawn on steep slopes, delicate pathways, or tricky outdoor steps. Fake grass is also a superb alternative for indoor floor covering and even walls. See examples of how our artificial turf can be used for all-year-round low maintenance lawns in homes, commercial areas, and for sports surfaces. 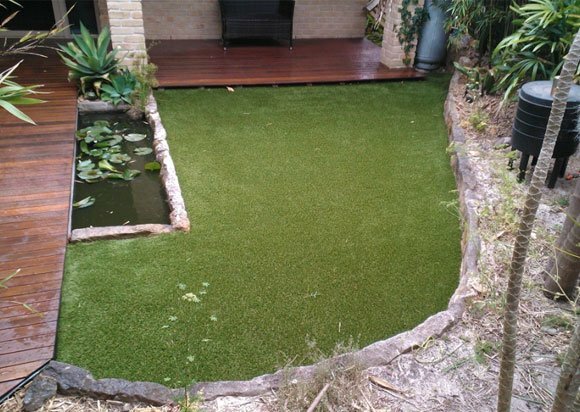 Our expert installers of synthetic turf and artificial lawns work all along the East Coast of Australia. These days, artificial lawns are no longer limited to just a sports field or bowling green. Artificial turf is now also used in a variety of locations, thanks to its striking looks and ability to save owners both time and money in maintenance. 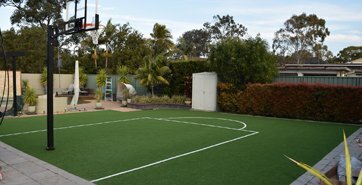 We have been installing residential artificial lawns, synthetic putting greens, tennis courts, cricket wickets, sports surfaces, and commercial and school projects in Queensland for many years. You’ll find plenty of pictures and samples of our synthetic work throughout our website. If you would like to speak to any of our previous clients, all you have to do is ask! At Surface-it our grass encompasses different widths, colours and shapes of the yarn, resulting in a product that looks and feels as close as possible to the real thing. Your friends may never know the difference! Our synthetic turf is sold with a genuine 8-year international manufacturer’s warranty. For schools and playgrounds, having low maintenance, non-abrasive surfaces for sports activities can be highly beneficial. When playgrounds and childcare facilities require critical fall height protection, any soft fall materials can potentially be covered by our artificial grass. Not only will it help make these areas safer, but they’ll also offer an aesthetically pleasing, cost effective, and long lasting solution. Sports grounds have extremely high traffic that often involve consistent movement and impact. Because of this, they often need ground surfaces that can withstand a punishing amount of wear and tear. With synthetic grass, however, you can keep your sports ground looking better for longer while keeping its appealing look. Artificial grass is the perfect surface for golf greens, and many golfers are turning to Surface-it to have a personalised putting green installed in their backyard. Developed for your individual skillset and making the best use of your location, your personal green can help you lower your handicap or simply be a great outlet for social gatherings. We also carry the perfect surface for getting your golf game on par. Our portable roll out putt is a durable, lightweight portable putting green that you can unroll and use just about anywhere. It’s important for your home or business location to make a good first impression. 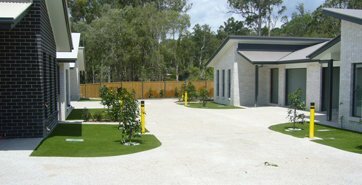 As such, synthetic grass has become a popular choice for Brisbane accommodation and function centres. Whether it’s a feature entryway, a modern boardroom design, or a relaxing environment for your staff lunchbreaks, artificial turf can easily provide a memorable effect, with little expense required for upkeep. If you would like help with ideas and advice for your location, our team is always here to help. Artificial grass ends up in many places where, for one reason or another, it is simply the most practical solution. Backyards where the sun doesn’t shine, around pools where chlorine kills natural turf, roof tops and terraces, and even in some quirky places where a bit of colour or just something different is required. Maintenance is minimal; the occasional brush or a blow is all that is required to keep a synthetic lawn looking in good order. And if pets are present, then the porous nature of our products allows them to be hosed if required. Fake grass has come a long way in design, and it provides many benefits for today’s busy world and even the environment. It’s a flexible solution for landscaping indoors or outdoors, creating a professional, manicured look all year round without having to water your lawn. Other situations in which artificial turf is also ideal include areas where heavy traffic predominates and those that experience more than its fair share of shade. Synthetic lawn offers several key advantages over natural grass. First is the time savings: the mower can stay in the shed! Then there’s water conservation, which is important in our drought-prone land. With it, you won’t need to regularly water and fertilise your grass! It’s perfect for the elderly or those with little time, requiring little maintenance to make it look great all year round. According to hydrologists, over 60% of all water used in summer months is for irrigation purposes, which means almost 2000 litres of water is saved per year for every square metre of artificial grass used in place of natural grass. Using synthetic grass also helps lower pollution rates. A lawnmower emits as much pollution in one hour as eleven cars, and grass clippings are the third largest component of rubbish taken to the tip. To give you the longest lasting and most durable outcome for your synthetic project, we are proud to use locally manufactured installation materials. This way, you can be sure they’re built to withstand the harsh Australian climate whilst being available at the most affordable price. At Surface-it, we’re particularly proud of our artificial grass range that has been exclusively made for the Australian domestic market whilst at the same time ensuring that the highest standards are adhered to in the production process. If you have an unusual location or requirement, we can cater for that as well, whether it be indoors or outdoors, floors or walls, or even for outdoor furniture and benches. We understand the intricacies of each stage of the synthetic process to ensure a professional and long-lasting finish that you can be proud of! Whether it’s for a home, business, sports ground, or school, there are a variety of ways you can use artificial grass to improve your surroundings without incurring extra time in upkeep and maintenance. Customers contact us from everywhere to seek recommendations for their general landscaping requirements as well as direction and ideas for laying artificial turf. 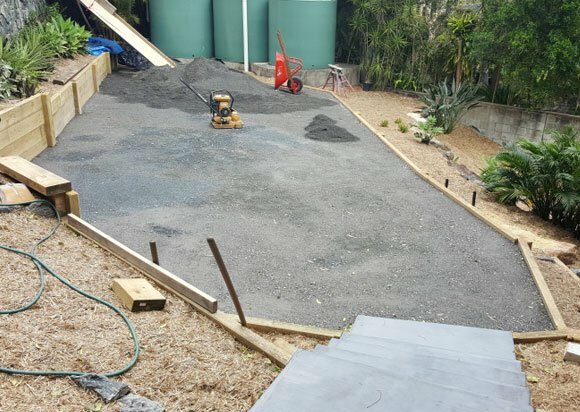 Australian landscapes have many unique features which are important to keep in mind during installation, particularly with respect to managing foundations and providing proper drainage. Surface-it has been installing artificial grass Brisbane wide for years, and we’re always ready to put our experience to work for you. Having been in the business for as long as we have, we know the best ways to prepare your base (which is critical to any landscaping project) so that your new artificial grass or golf green will bring many years of pleasure and enjoyment. 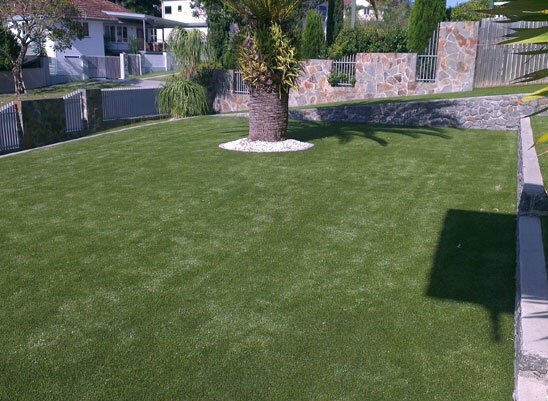 Surface-it also offers artificial grass to the market at wholesale prices to meet end-user requirements for self-installation of your own fake grass and synthetic turf. Our DIY range includes some of our sports grass products and a selection of natural looking residential landscape artificial turf. See our wholesale page for just a few samples of the different options we carry. If you would like to know more about tackling a DIY project, just get in touch with us to learn tips and best practices. We are happy to provide advice about tools and materials as well as guidance to make any DIY turf installation a reality. Our step-by-step artificial grass installation guide is available for all DIY customers. We can also assist you with the acquisition of all the peripheral materials you will need. We are here to help with as much, or as little, of the project as you are comfortable with or your particular skill set permits. Be as creative as you like with a little guidance from our team of experts. And remember: the more you do, the less you pay! We offer the most flexible solutions to ensure you get the best result for the keenest prices possible. Working with you and understanding your individual needs and requirements, our team will craft the finest solutions for your landscaping project. Coupled with our great prices, you can trust our years of knowledge and expertise to give you the right advice for your artificial grass. Synthetic turf is a great solution for many areas, and having access to our team of professionals can help you achieve fantastic results. The Surface-it reputation is based on great customer service and our stunning end results! 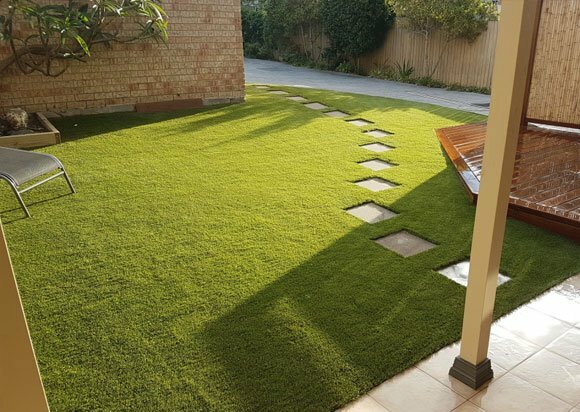 We encourage you to take a look at our latest projects page and chat with our previous customers of artificial grass Brisbane wide, all of whom are delighted with their synthetic grass. Communities throughout the East Coast of Australia have been cheerfully looked after by our team for years, and we now invite you to join this growing group. Our goal will always be to provide you with the best possible artificial grass experience in Australia. Making a beautiful space that’s cost effective and easy to maintain is what we love to do. At Surface-it, you’ll find the right synthetic turf and artificial lawn you need for your property. We’ve been installing artificial grass across Brisbane and the East Coast for several years, so we can help you create the lawn you’ve always wanted.